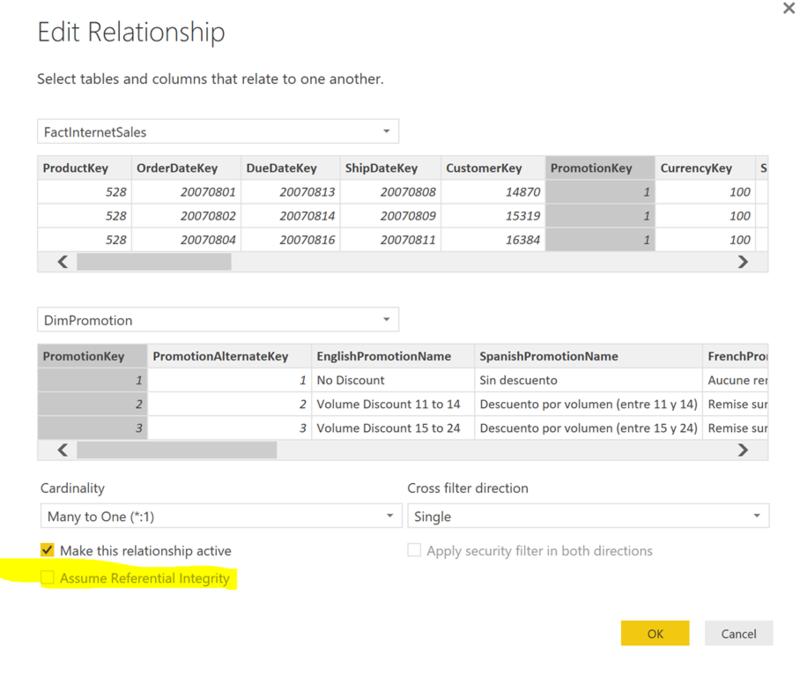 If you have ever looked at the queries generated by DirectQuery you will see that a query that retrieves data from multiple tables gets joined by a left outer join. This might not be what you would expect but this is a actually a solid design choice. The reason is that if your data would have any keys that would be missing due to referential integrity issues on either side you would never notice and data would get dropped. 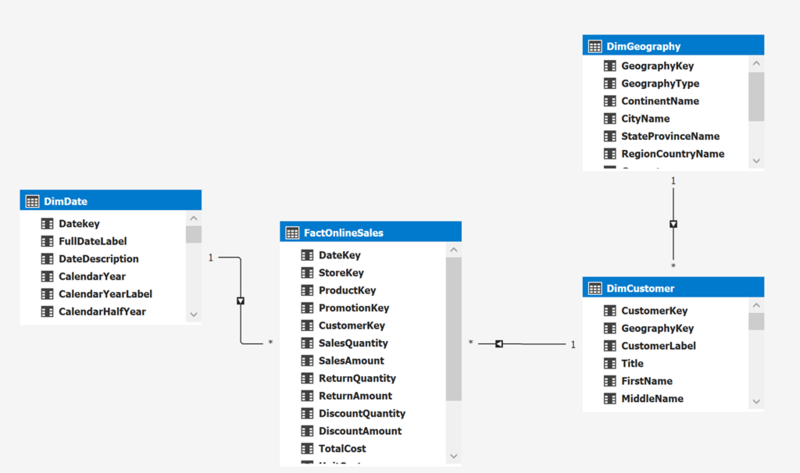 When using the SSAS storage engine instead of DirectQuery data with referential integrity will always be shown, an empty row in the dimension will automatically be added to the result set. Translating this to SQL a left outer join will make sure missing values will also be shown. Unfortunately a left outer join is usually not as performant as an inner join. Luckily we give you an option to make a conscious decision and allow you to use inner joins instead. This makes a huge performance impact but again you have to make sure that you are ok with data being dropped if you have referential integrity problems. This usually is not a problem when you are using an actual curated data warehouse, it may be an issue when you are joining a less curated data source. And remember the fact table contains 2 billion rows. and add a property on every relationship we want to use Inner join. The property is called “relyOnReferentialIntegrity” and needs to be set to true. The default is false. Now after saving this and reopening the designer (this reapplies the changes of my script to my workspace database). 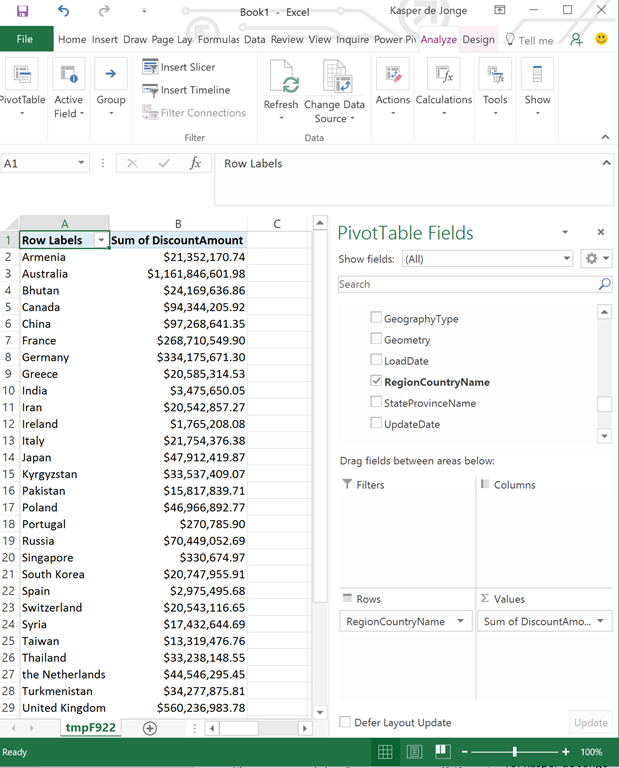 I then refresh my PivotTable in Excel. We immediately see a huge performance gain, we went from 4244 to 1144 ms.
Of course your millage might vary but setting this property should be done as often as possible, when your data permits it. Ditto. I remember reading a white paper from Marco a couple years ago where he demo’d ~4 billion. It would be nice to get a script/data source for this! What I did is just generate more data. 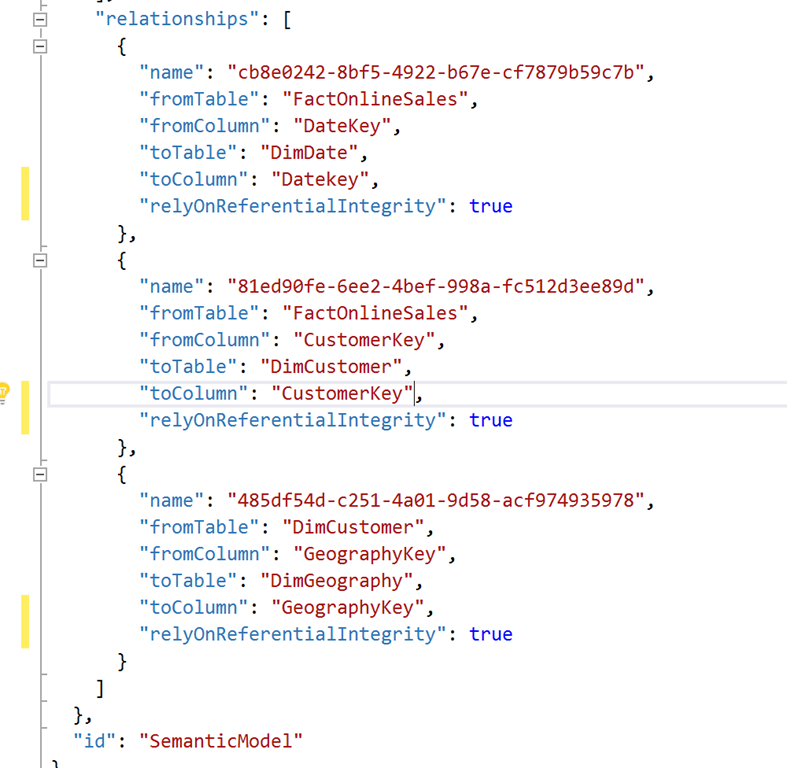 I used the MecDataMart from the old BI VM and wrote a few sql scripts to duplicate fact data. This works pretty good. Thanks Kasper. I’m going to use the free trial from Redgate for generating test data: http://tinyurl.com/huygpjv but may well go with SQL scripts as opposed to the $370/user license. I need to test with larger dimensions (e.g. 1-2M+ row customer and product tables) and want the dataset to be as realistic as possible for real world large client scenarios.